For many people, skydiving is a once in a lifetime experience. It’s something they tick off their bucket list, enjoy it, but never consider returning for another jump. Here in the US, tens of thousands of people make their first skydive every year. A growing number of those people are coming back to do more skydives, eventually gaining their skydiving licenses and turning this one off jump into a lifelong hobby. The adventure sport skydiving community in the US and, in fact, worldwide, is active and thriving. Skydiving is most definitely a sport and one in which thousands of people the world over are participating. There are even skydiving and parachuting competitions which pit solo and team skydivers against one another to find out who’s the best. The definition of a sport is a “physical activity that is governed by a set of rules or customs often engaged in competitively”. Is skydiving a sport? Yes, it is. Find out more here. Skydiving has evolved over recent years in particular to utilize more technology and engineering than ever before. The equipment we use today is far superior to that of even ten years ago as the community continues to invest in new innovations. Another area where skydiving is really thriving is in the innovation of physical techniques. Our understanding of how our bodies move in the air has progressed significantly. Skydivers are always improving their own knowledge through coaching and lessons to help them be better as flyers. One of the main things that makes skydiving such an incredible sport is this focus on innovation and self-improvement. As with any sport, skydiving is one in which hard work, perseverance and a passion to succeed are rewarded with improved abilities, skills and accomplishment. 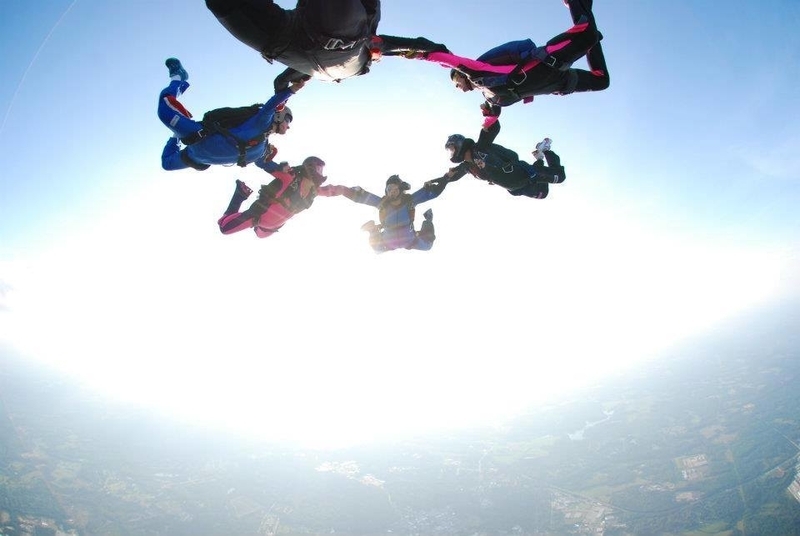 Within skydiving, there are lots of disciplines – or types of skydiving – that people can compete in. Within each discipline, there are set rules which make it judgeable and measurable. Each one has a different skillset that its competitors learn and practice for years. World class coaches, especially here in the US, attract skydivers from across the world to come and learn from the best. The pursuit of excellence is present across all disciplines, making skydiving an incredibly exciting sport to be part of. It’s like that, if you’re making your first skydive, you’ll do so as a tandem skydiver. This means you’ll be attached to a highly experienced and qualified instructor, who will be responsible for using the equipment and who will be with you throughout your jump. Formation skydiving is done in a belly-to-earth orientation – similar to that used in tandem skydiving. The stability in flight comes from the arched body position FS flyers adopt. Through an understanding of the aerodynamics of their bodies, these skydivers are able to move around the sky and do so in groups of usually 4 or 8 to create a series of set formations. Judges are looking for the correct formations being shown as many times as possible in the correct order within 35 seconds of ‘working time’. A camera flyer flies above the formation to record the jump and the FS flyers work together to complete static and dynamic formations to the highest standard they can. VFS is similar to FS in that it requires its flyers to complete a series of set formations as quickly and efficiently as possible. There are four performers in a VFS team and one camera flyer. The main difference is that the flyers, rather than using a belly-to-earth position, use other angles such as head up and head down. VFS flyers are moving much more quickly toward the ground due to their more aerodynamic positions. Learning to fly as a VFS flyer takes a long time, as the positions adopted are less stable and therefore more advanced than those in FS. Freestyle is a solo discipline in indoor skydiving and a two person discipline in outdoor skydiving (one performer and one camera flyer). Flyers show off their moves in the airflow in what looks much more like dance than falling. Some freestylers adopt a ballet-like style, where moves are fluid and considered. Others choose a more staccato way of flying. Judging is based on interpretation and on the difficulty of the moves shown in a given routine. There is a mix of free routines – in which the flyer performs a routine they have previously choreographed – and compulsory rounds, in which they perform moves set by the competition. Dynamic and freefly are more disciplines which take advantage of non-belly-to-earth flight. Similarly for freestyle, there are free and compulsory rounds, allowing the flyers to show off their range of skills. Competitive skydiving isn’t limited to what we can do in freefall. Displays of parachuting ability are also competitive and judgeable in various ways. In canopy piloting, the competitor is judged on different factor depending on the competition. In accuracy competitions, the pilot is judged on their ability to land on a specific target. In distance competitions, the pilot is judged on how much distance he/she can cover across the ground using their parachute. Another competitive element of canopy piloting is canopy relative work, or CRW. This is where multiple canopy pilots work together to create canopy formations in the sky. In a similar way to FS and VFS, they are given a set order of formations to complete within the given working time. By taking hold of one another’s parachutes, they can create very beautiful ‘stacks’ and move around those stacks using their skills as pilots. Again, a camera flyer films the action, this time by flying under his parachute behind and around them. There are skydiving competitions held throughout the year at a local, regional and national level. The USPA skydiving nationals is an annual event which pits the very best in every discipline against one another to find the best, who then go on to compete on the world stage. As we touched on earlier, the US has some of the greatest sports skydivers in the world and as such, attracts competitive skydivers from around the world to come here for coaching. The ability to compete in skydiving comes with a whole lot of work! From training at the gym to making hundreds of practice skydives together to investing in the very best coaching, sport skydivers have to make a big commitment to their discipline if they want to be the best. Of course, not everyone does seek to be the best, or even have the ability to invest in getting there. For many, skydiving, even competitively, is still all about having fun and that’s why we see lots of less experienced, lower level teams at our competitions too. It’s also not all about competition if you want to be a skydiver. So much of what makes our sport great is the community we have and the fun of taking part and spending weekends at the skydiving center with our friends. You don’t have to get into skydiving to compete. Skydiving is an incredible community that you can go to have fun, attend events, camps, meet new people and create an incredible community. Other goals in skydiving could be earning the next license, gaining skills necessary to be on a world record, or becoming an instructor. Find out about learning to skydive with us or, if you’re an experienced jumper already, check out what we have to offer to you and your team, or get in touch to discuss your next training camp with us.